So what do you expect when you visit these places? In Nagoya alone, there are a lot of tourist attractions like the Nagoya Castle, Shirotori Garden, Atsuta-Jingu shrine, Nagota City Science Museum, Tokugawaen Garden and more. For Seoul, there is Gyeongbokgung Palace, Myeongdong shopping district, the N Seoul Tower to see the panoramic view of the metropolis, Cheong Wa Dae which is the official residence of the president of the Republic of Korea, the Changdeokgung Palace and etc. A lot to see! Go check it yourself. And Los Angeles, Hollywood is there! Everything is in that city of stars! Of course, the merlion city, Singapore has a lot of manmade gardens and beautiful scenic spots to offer. 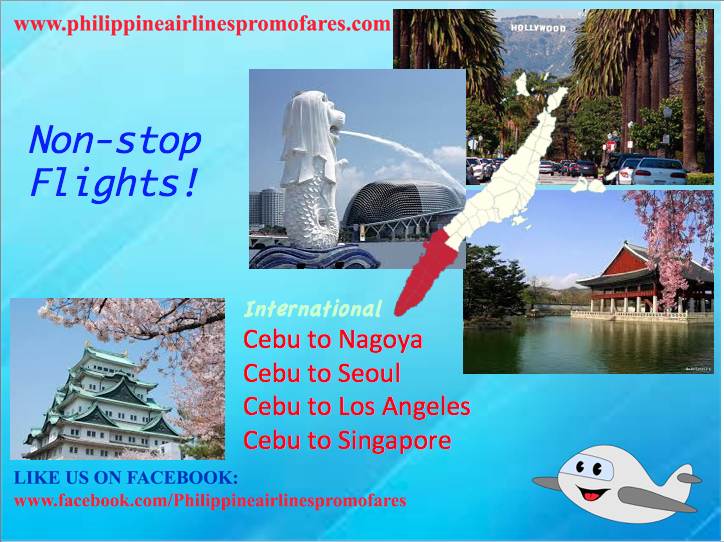 Get free baggage allowance, free hot meals, ample legroom and heartfelt service that come from the Heart of the Filipino.